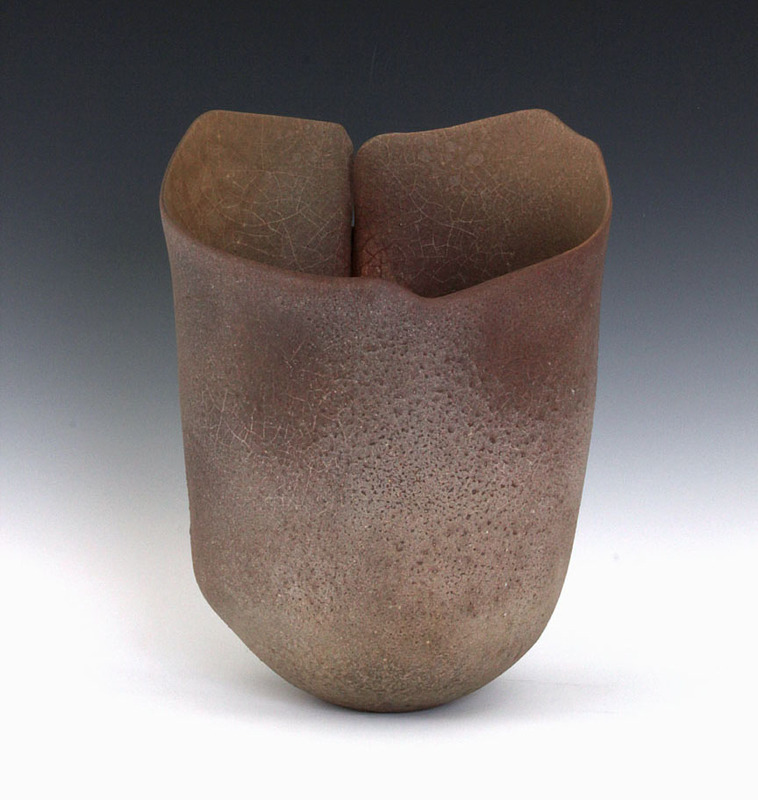 Another artist I’m happy to be featuring in Frank’s International House of Ceramics, Part Three, is the Japanese artist Satoru Hoshino. Born in the Niigata prefecture in 1945, he graduated from Ritsumeikan University in 1971. 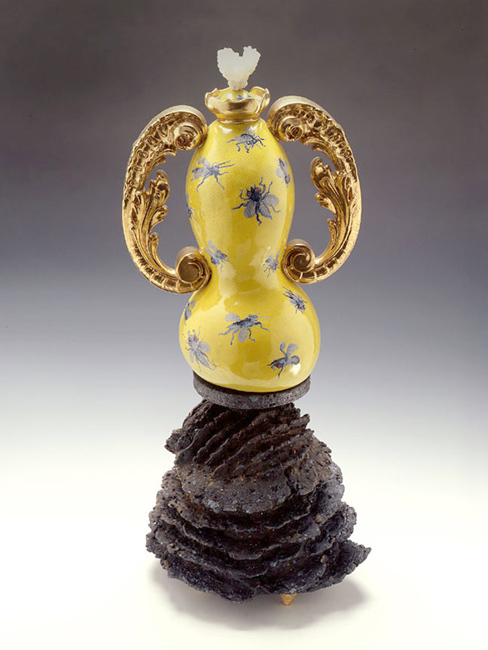 Although he had already been working in ceramics for 15 years, Hoshino experienced a turning point in his artistic practice when a landslide destroyed his studio in 1986. Witnessing the devastating power of nature led to a change in the artist’s approach to his medium. 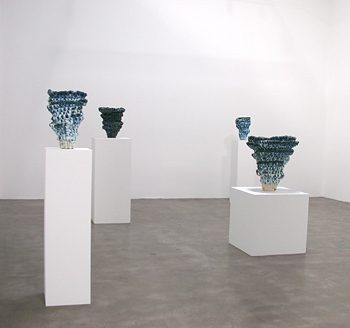 Hoshino describes his process as a collaboration between himself and his materials. He does not consider clay to be a passive recipient of his actions, instead conceiving of his work as a dialogue between equal partners. Rather than imposing his own desires on earth and clay materials, Hoshino strives to bring out the inner life of the clay. 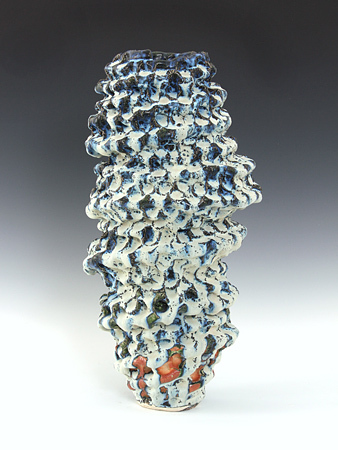 In an essay for Ceramics: Art and Perception in 2000, he writes that his work “is the result of a joint effort, like that of two people in a three-legged race, between myself and the medium of clay.” His towering coils are imprinted with the mark of his thumb and forefinger, leaving a direct record of his engagement with the material. Hoshino’s body of work includes large-scale installations that can fill entire rooms as well as more intimate objects that can be held in one’s hands. Leah Ollman wrote in her Los Angeles Times review of Satoru Hoshino’s 2008 solo exhibition that his sculptures have an “air of immediacy, of raw organic matter worked by a reverent hand, of primal forces in concert.” Honoring both the physical properties of the clay and the process by which the material is transformed, Hoshino seeks to reexamine human beings’ relationship with matter and nature. We’ll have three of his stunning works from the Spring Snow series on display in our upcoming show, opening on February 9th. 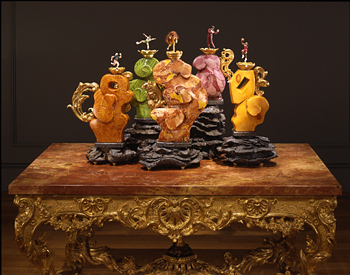 Although they have produced distinctly different bodies of work, the artists Richard Shaw and Adrian Saxe do share something: they are both virtuosos with ceramic glazes. 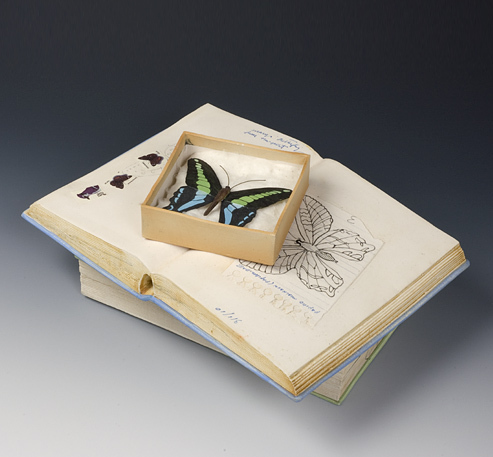 Shaw’s trompe l’oeil technique is the result of years of research into ways of simulating reality. 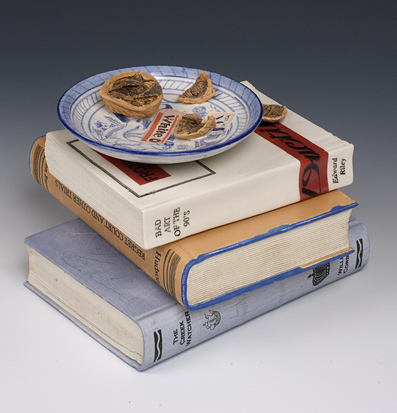 He discovered (and developed) a method of making over-glaze transfer decals, which allows him to realize lifelike objects in his still life sculptures. 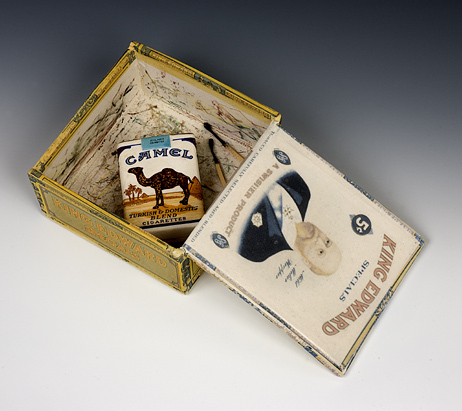 It’s an adaptation of commercial printing, using a process that is very much related to silk-screen printing. He’s able to transfer images (made out of over-glazes) directly onto the mold-made objects, and fire the colors onto the surface. 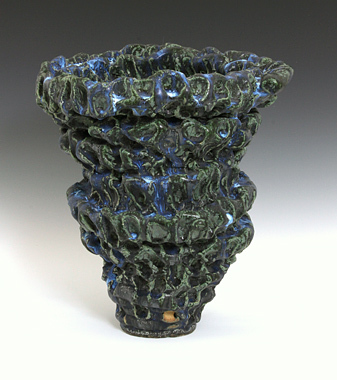 Saxe, on the other hand, has spent decades working with glaze chemistry, and includes an astonishing array of glaze effects on the surface of his work. The sources are from ancient Chinese dynasties, or from luxurious lines of royal porcelains made for French kings—but also from the artist’s experimentation in his amazingly scientific laboratory (studio) in Highland Park. 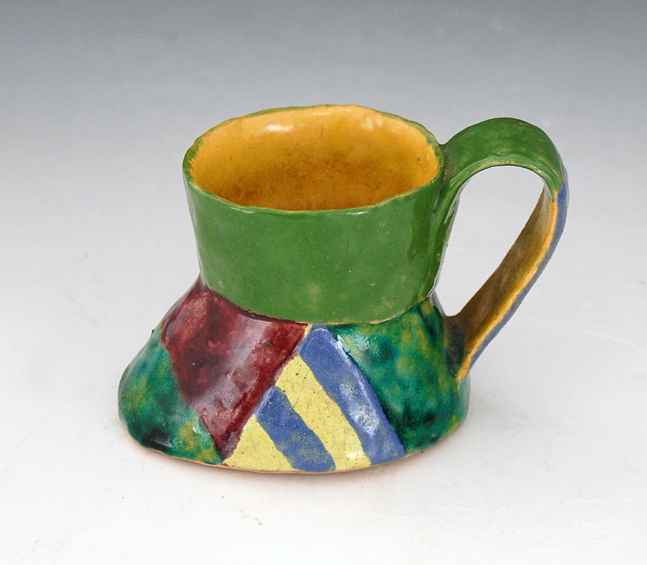 Saxe is able to tell a visitor the ways that a glaze will vary, according to the percentage of one mineral element, or with the slightest change in duration or temperature of the firing. 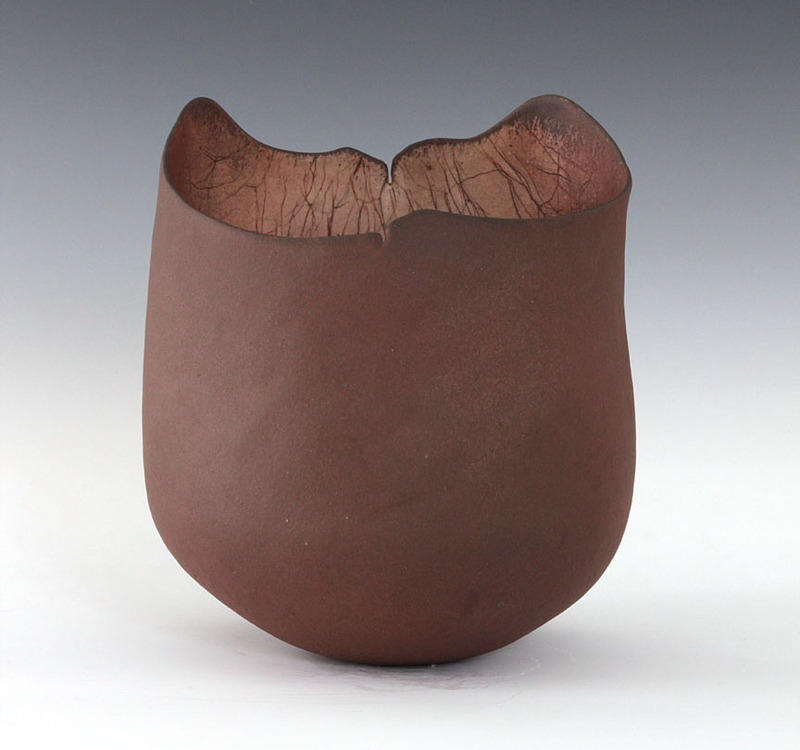 He knows exactly how to position every pot in the kiln, and how to get, for instance, the copper to transfer into the kiln atmosphere at the final stages of a firing—producing a rosy red blush on an adjoining piece. Both of these wizards of glaze effects will be talking about ceramics (and most likely lots of other things, like contemporary culture) at the gallery on the morning of February 9th at 10:30 a.m. This program, a continued effort to provide our clients and the community with free arts education, is sponsored by the gallery and open to the public. It’s a rare and amazing opportunity to hear two University of California professors of art in conversation—without having to pay a cent of tuition! Getting behind the scenes and into an artist’s studio is always exciting, and can help you get a fuller sense of who the artist is as a person. This video, produced by KQED public television for their arts education program Spark, takes viewers into the studio of Richard Shaw. Richard has lived and worked in the Bay Area for years, and this video segment really captures his laid-back attitude and sense of humor. 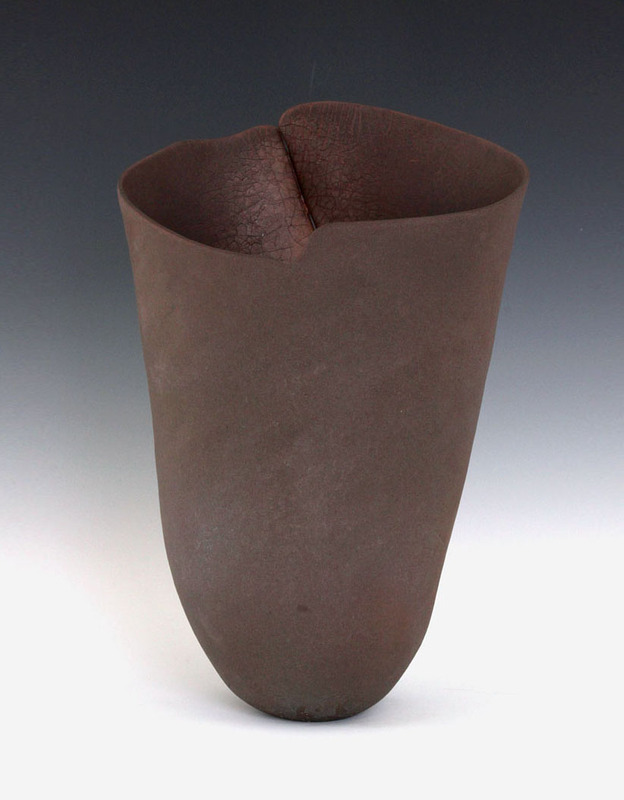 Another artist I’m happy to be featuring in Frank’s International House of Ceramics, Part Three, is Richard Shaw. Born in Hollywood in 1941, Shaw has spent most of his life in the Bay Area, where he has lived, worked and taught since the 1960s. The last time we showed his work at the gallery was for his 2009 exhibition Still Life, so it’s exciting to have new examples of his signature trompe-l’oeil arrangements. 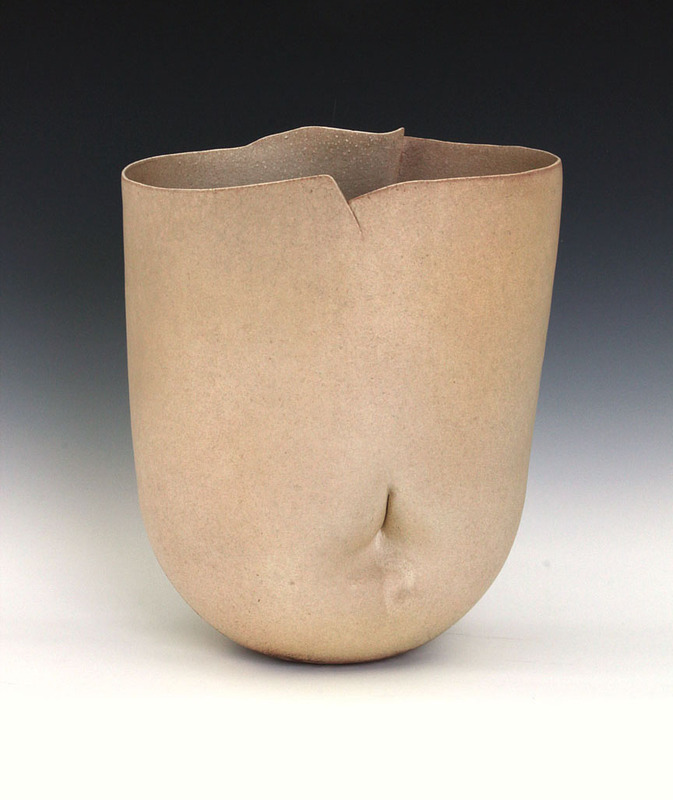 The heart of Richard DeVore’s mature career centered on his continual investigation into the expressive capabilities of the vessel. While his reliance on a few basic forms might suggest a certain conservatism, DeVore pushed those shapes to their very limits, incorporating slits, dimples and rim irregularities as well as double floors and concealed interior shelves and membranes. 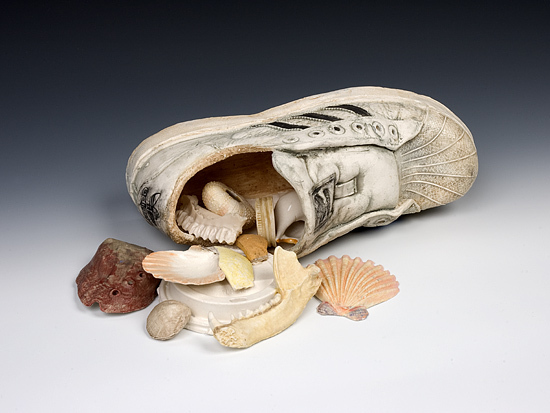 His works expand viewers’ conception of what a vessel is, and how it functions in the world. 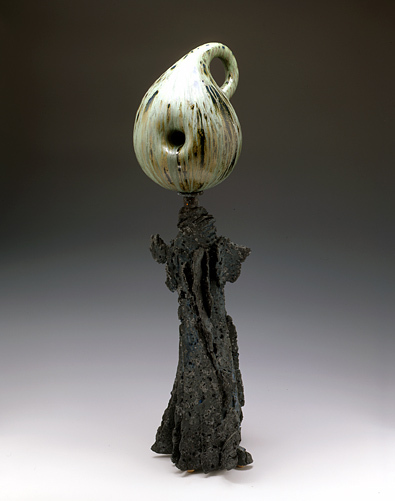 Our upcoming show at the gallery, Frank’s International House of Ceramics, Part Three, will include several examples of Richard DeVore’s evocative work. I hope you’ll have the chance to come and see it in person when it opens on February 9th, 2013. The Frank Lloyd Gallery maintains a Vimeo channel, where we post videos of events held in the gallery. These videos document exhibition walk-throughs or conversations with artists, and allow friends of the gallery who were not able to attend the event in person to experience it nonetheless. So far we have produced five examples. 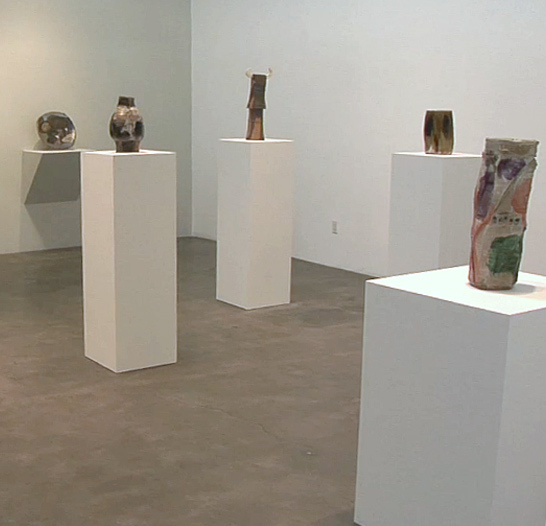 The first of these videos is an exhibition walk-through of our Pacific Standard Time show, Larry Bell: Early Works. We followed that up with an interview of Larry Bell by Hunter Drohojowska-Philp, where he shared the story of his discovery of the thin-film evaporation process. 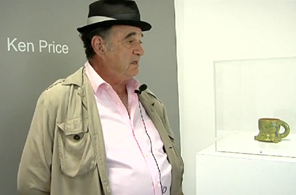 The gallery’s next video production documented another of our PST shows – Peter Voulkos in L.A.: Time Capsule. 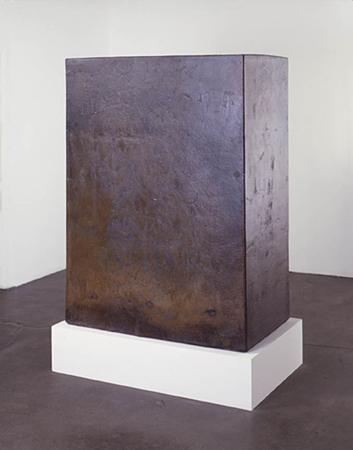 Both Larry and Ollie Bell spoke about Peter Voulkos’ historical significance within the Los Angeles art scene, and offered commentary on the show, which presented work from the artist’s personal collection. Our most recent videos document two shows that we exhibited over the summer. In one, I interviewed Scot Heywood regarding his show Polarities. Scot was great, speaking insightfully about his artistic development. In the other, Larry Bell returned to lead an exhibition walk-through of our Ken Price show. His close personal and professional relationship with Ken really came through as he shared stories about the artist and his work. If you haven’t seen all of the videos we’ve produced, I encourage you to take a look at them on the Frank Lloyd Gallery Vimeo channel. We’re working on producing more of these, so stay tuned!